Work relationships can transform careers — especially when co-workers vote on pay raises. 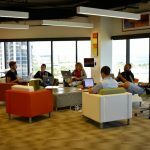 At Squaremouth, a travel insurance comparison website, employees vote on some salary increases, according to CNN Business. Those seeking a raise can argue their cases to colleagues and, hopefully, receive their buy-in. Transparency is at the core of this business tactic, says Squaremouth. The company has been using peer-reviewed raises since it was founded in 2003 and shares all salaries internally. In addition to the group-vote raises, all employees receive an annual cost of living raise, based on inflation. In January, that increase was 2.1 percent. Separately, workers can receive merit-based raises. These come directly from managers and are mostly used for promotions or when employees get a new job at the company. When employees request pay raises, colleagues typically have until the end of day to reach a verdict. All votes hold equal weight and employees must provide an explanation for their decision, which are not anonymous. To receive a raise, an employee needs to secure a majority. Once a decision is finalized, the employee requesting a raise receives the feedback from their colleagues. “That eliminates anyone from saying ‘no’ for a personal reason,” says marketing and sales director Megan Moncrief, adding that peer-voting is mainly for big jumps in pay.